Get ready for your tropical vacation in less than an hour! Packing for a Caribbean vacation is a lot like packing for any other tropical destination: bringing protection from the sun and heat is key. But you also need to be prepared for the unexpected -- and to play and party! Make sure you have all of your travel documents in order and secure in a safe but accessible place. This includes a valid passport, driver's license, airline tickets and/or boarding passes. A pocketbook or outside pocket of your carry-on bag is ideal since you'll need easy access at the airport and upon arrival at the hotel. Also, be sure to pack copies of prescriptions for medications, which should be carried in their original containers. Make sure you know if the island you are traveling to requires a passport (most do). 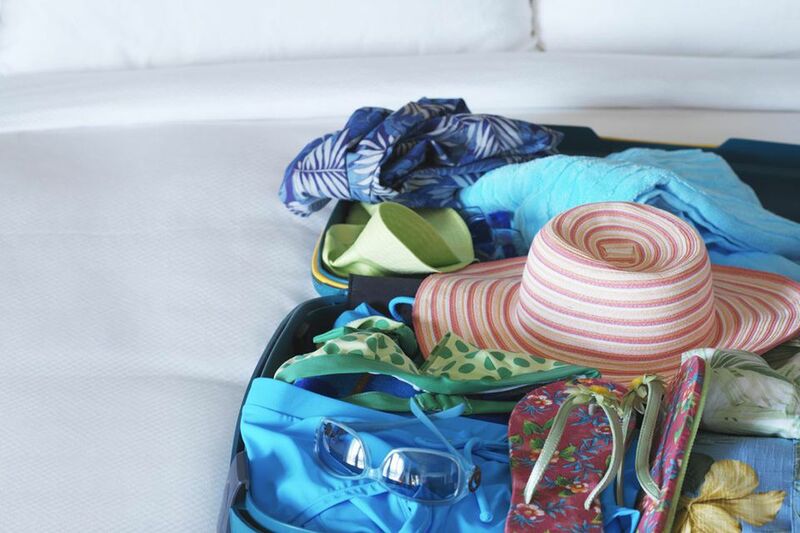 In your carry-on bag, pack your toiletry bag and at least one change of clothing, as well as a bathing suit. In the Caribbean it is not uncommon for your luggage to be delayed at either the airport or in transit to your hotel. Being able to slip on a swimsuit and wait poolside for your bags beats stewing in the lobby! Also, bring some small bills for tips and cash for cabs and other services. Choose a full-sized suitcase or soft-sided luggage bag. Wheeled luggage is best, since some Caribbean airports require you to deplane on the tarmac, while others feature long walks from the gate to ground transportation. Larger resorts, and those that have individual villas, can also be spread out, meaning a hike to your room if you're too impatient (like me) to wait for a porter. Rolling your clothes to prevent wrinkling and save space, pack the following basics: socks and underwear (bring a few extras so you can change on hot days), at least two pairs of cotton, khaki, or linen pants (these are lightweight and dry quickly; leave your denim jeans home), plenty of shorts (can double as a swimsuit in an emergency), and t-shirts. For evening or excessively air-conditioned hotel lobbies and restaurents, bring a light sweater or jacket. For women: Different islands have different customs and mores: check first before you pack that skimpy bikini or those short shorts. Capri pants are a cool compromise between shorts and slacks. Bring at least one nice dress for evening. Leave expensive jewelry home, or use the in-room safe, if available, when not wearing; there's no sense in tempting thieves. For men: Pack some collared golf shirts, preferably in light colors with simple patterns. You can wear them anywhere day or night, even under a light suit jacket for a fancy dinner. For the beach, pack at least two swimsuits (nothing more annoying than putting on a soggy bathing suit, which dry slowly in the muggy tropics), multiple pairs of UV-rated sunglasses, waterproof sunscreen (SPF 30 minimum), a brimmed hat (to protect your head, face, neck and ears from the sun), and a sarong or wrap (for women). You should also bring some aloe vera to soothe an inevitable sunburn. In your toiletry bag, besides the usual toothbrushes, razors, deodorant, and feminine items, don't forget to pack lip balm (hot sun equals chapped lips), bug spray (especially useful for hikes or other inland activities), and baby powder or Desitin (nothing more irritating than chafing at the beach). In an outside luggage compartment or inside shoe valet, pack tennis shoes, flip-flops or sandals, water shoes/tevas (I once had to rent these in Jamaica -- gross! ), and at least one pair of dressy shoes for evenings. Tourist brochures are always sunny, but it does rain in the Caribbean, a little bit almost every day in some places. Pack a compact umbrella or a light, waterproof hooded jacket, or prepare to be soggy on occasion. Pack a camera in your carry-on or checked luggage; if the latter, use a protective case or use your clothes to cushion the camera for travel. Bring plenty of film and/or digital media from home; these can be expensive in the islands. Pack your film in your carry-on to prevent damage from heavy-duty x-ray machines used to inspect checked bags. If you plan to snorkel, bring your own: this is another item you don't want to rent. On the other hand, you may find it easier to rent (or borrow) golf clubs or tennis racquets than to pack your own. Make sure to leave some space for those souvenirs and gifts for the kids and Aunt Mabel. Better to underpack a bigger suitcase than to have to lug an unwieldy shopping bag back through the airport on the way home. Wear to the airport some of your bulkier items, such as jackets and dress shoes. But be sure to pack, not wear, metallic items like belts, watches, and shoes with metal inserts or grommets to avoid delays at security checkpoints. Zip up your bags -- you're ready to go to the Caribbean! Bring a small backpack or cloth bag along to throw your stuff in when you head to the beach or off on an excursion. Drawstring bags are a particularly favorable option. Leave home what the hotel provides: this almost always means soap, shampoo, and hair dryers, and usually towels for room and pool/beach. Within reason, pack light. The less you pack, the less you have to carry. Most clothes appropriate for the Caribbean are lightweight to begin with, and can be worn more than once on a trip. Don't pack camouflage clothing: Caribbean countries like Trinidad & Tobago, Barbados, and Dominica, prohibit civilians from wearing camouflage. Now get packing and get going!